Dual injection is recommended for nearly all chronic total occlusion (CTO) percutaneous coronary intervention (PCI) to determine the optimal crossing strategy and guide wire advancement into the distal true lumen. Strategies that provide enhanced guide catheter support (such as long sheaths, large-bore guiding catheters, use of guide catheter extensions, and anchor techniques) are important for maximising the success rate and efficiency of CTO PCI. Use of a microcatheter or over-the-wire balloon is strongly recommended in CTO PCI for enhancing the penetrating power of the guidewire, enabling change in tip shape and allowing guidewire change (stiff CTO guidewires are not optimal for crossing non-occluded coronary segments). Adherence to a procedural strategy that standardises CTO technique and facilitates procedural success is recommended. Such a strategy would permit stepwise decision-making for antegrade and retrograde methods; inform guidewire selection; and incorporate alternative approaches for instances of initial failure. Given the paucity of long-term outcomes with use of novel crossing techniques (antegrade dissection/re-entry and retrograde), antegrade wire escalation is the preferred CTO crossing technique, if technically feasible. 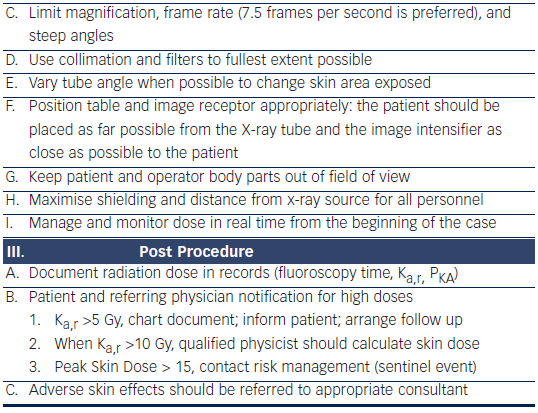 Using measures to minimise radiation exposure (including but not limited to use of 7.5 frames per second fluoroscopy and use of low magnification) and contrast administration is recommended. CTO PCI is best performed at centres with dedicated CTO PCI experience and expertise. Use of crossing difficulty prediction tools, such as the J-CTO score, can facilitate the selection of cases with a high likelihood of quick crossing that can be attempted at less experienced centres. Dr Grantham: educational grants from Abbott Vascular, Medtronic, Asahi-Intecc, BridgePoint Medical; speakers bureau, consulting fees and travel support from Abbott Vascular, BridgePoint Medical and Boston Scientific; CTO Scientific Advisory Board Boston Scientific, Banyan medical systems, Vascular solutions, Terumo; founding member of a web-based CTO-PCI education initiative called CTOFundamentals.org. All funds are paid to Saint Luke’s Cardiovascular Consultants or the Saint Luke’s Hospital Foundation. Dr Kandzari: Boston Scientific (advisory board/board member, grants or research support); Abbott Vascular (grants or research support); Micell Technologies (consultant); Medtronic (advisory board/board member, grants or research support); Dr Lombardi: BridgePoint Medical (stock owner or shareholder); BridgePoint Medical (consultant, advisory board/board member; Dr Thompson: employee, Boston Scientific; Dr Werner: speaker for ASAHI Intecc, Abbott Vascular, Biosensors, Terumo; principal investigator of a randomised trial on the benefit of CTO PCI vs medical therapy conducted by the EURO CTO Club sponsored by ASAHI Intecc and Biosensors; Dr Brilakis: consulting/speaker honoraria from St Jude Medical, Terumo, Janssen, Sanofi, Asahi, Abbott Vascular, Boston Scientific; research support from Guerbet; spouse is an employee of Medtronic. Dr Galassi, Dr Moussa and Dr Chambers have no conflicts of interest to declare. The authors would like to thank Ms Sheila Agyeman for her invaluable effort in coordinating the manuscript creation process. The femoral approach is the preferred access route by most operators. However, the radial approach might be chosen because of severe peripheral vascular disease, operator’s preference or for contralateral injection. The guiding principle of access selection is that operators should use access routes that support their typical and optimal technique.1 The relative merits of potentially larger sheath/guide sizes (femoral) can be weighed against the reduction in vascular complications and improved patient comfort (radial).2,3 Both are acceptable. When femoral access is used, long (45 cm) sheaths can overcome iliac tortuosity and increase guide catheter support. Anticoagulation during CTO PCI is best achieved with unfractionated heparin because it can be reversed with protamine in case of perforation and also allows titration of the anticoagulant effect (an activated clotting time of >350 seconds is recommended by many operators during retrograde CTO PCI to minimise the risk of donor vessel and guide thrombosis).8 As with all PCI, preloading with a P2Y12 ADP receptor inhibitor is important to reduce the risk of acute stent thrombosis and peri-procedural myocardial infarction. This technique is applied when the first wire enters the false lumen. The first wire is left in place, and a second wire is passed parallel to the first wire aiming for the distal true lumen. Following this approach, the first wire keeps the dissection channel closed and serves as a marker for advancing and redirecting a second wire, which is selected for greater stiffness and control to overcome lesion resistance.17 Occasionally, three or more wires are used. Use of the parallel wire technique can reduce the need for multiple antegrade contrast injections, given that the first wire serves as a marker. Improved guidewires and modern re-entry techniques have reduced the need for parallel wiring in many programs. In order to simplify the original STAR technique and to make it more widely applicable, Carlino et al. introduced the contrast-guided STAR technique,21 which consists of gently injecting contrast into the subintimal space via an over-the-wire balloon or microcatheter or by employing the “microchannel technique”22 where contrast is injected with the aim of enlarging and connecting the microchannels that already exist within the occluded vessels. Galassi et al.23 further refined the STAR technique by proposing the “Mini-STAR” variant that uses very soft polymeric guidewires, the Fielder family of wires, Asahi Intecc (Nagoya, Japan). By forcing this type of wire with support from a microcatheter, a J-tip shape is automatically created within the occlusion, allowing for “mini subintimal tracking” and the creation of significantly smaller subintimal spaces. Finally, the limited antegrade subintimal tracking (LAST) technique, introduced by Dr Thompson and Dr Lombardi, is a similar technique designed for refractory anatomies. It uses a stiff, polymer-jacketed wire or a stiff, nonjacketed, penetration wire to redirect to the distal true lumen after facilitating device advancement with the knuckle wire technique.24 Wire-based subintimal tracking techniques, irrespective of the method chosen, are best applied only as a bail-out to refractory antegrade and retrograde procedures in well-selected patients. Retrograde wire crossing indicates lesion crossing in the distal to proximal cap direction with successful true lumen access to the proximal vessel.8 The standard approach after successful retrograde wire manipulation includes placing the wire and then the microcatheter into the antegrade guide catheter and then exchanging for a long wire to be externalised from the antegrade guide.32 The externalised wire, such as the ViperWire™ Advance (CSI, St Paul Minnesota), R350, Vascular Solutions (Minneapolis, Minnesota), RG3 (Asahi Intecc) is then used as the interventional platform to complete the PCI procedure.33 It is important for the retrograde guidewire to remain covered by a microcatheter to protect the collateral vessel from injury and to pay careful attention to guide movement to prevent guide-induced donor vessel injury. This technique combines the antegrade and retrograde approaches,34 although CTO penetration is achieved from the antegrade route. If the CTO lesion is relatively soft, the retrograde wire can be advanced easily, with the operator stopping the wire half way through the lesion. If the tip nears the CTO proximal cap, the operator can aim the tip towards the antegrade guide wire. Eventually, the antegrade and retrograde guide wires meet or “kiss”. This technique is generally used to reduce the use of contrast and to eliminate any potential ambiguity regarding the course of the vessel, thus making advancement of the antegrade wire safer. After crossing with the antegrade wire, the balloon catheter is advanced into the occlusion and dilatation is performed. The kissing wire technique is rarely performed by experienced retrograde operators, as the reverse controlled antegrade and retrograde tracking and dissection [CART], as described below) technique provides a more consistent method for connecting the channels in refractory cases. The principle of this technique is to create a subintimal dissection with limited extension only at the CTO site, thereby facilitating antegrade wire crossing. In practice, this involves exchanging the microcatheter for a balloon catheter after septal collateral dilation with a Corsair catheter or a small balloon (however, epicardial collaterals should never be dilated). This balloon catheter is advanced retrograde into the lesion and overlapped with the antegrade equipment. Dilation with an appropriately sized balloon will typically create a connection between the antegrade and retrograde spaces, which can be subsequently wired. The main disadvantages of this method include the need to pass the wire into an often small and diffusely diseased distal lumen and the inability to effectively use intravascular ultrasound to optimise the strategy. While significant variability exists with many operators with respect to procedural approaches, the “hybrid method” for CTO PCI represents an effort to standardise initial and provisional technique selection based on patient anatomy (see Figure 1).7 The implementation of the hybrid method requires skillset development in optimal wire manipulation, dissection/re-entry strategies and retrograde techniques. The development and adoption of only one or two of these skillsets will ultimately limit the experienced operator who wishes to approach all patients with appropriate indications for revascularisation. Failure to develop all three skillsets will likely lead to the dilemma of underutilisation of revascularisation in subgroups of patients who may derive the greatest benefit from these techniques. Although less common than failure to cross a CTO lesion with a guidewire, occasionally a coronary lesion cannot be crossed with a balloon or cannot be dilated with a balloon. It is important to confirm that the guidewire is in the vessel architecture or in the distal true lumen before proceeding with any over-the-wire catheter or before applying various dilation strategies. The vessel architecture can usually be determined by observing calcium deposits or other signs of the vessel outline moving or “dancing” in sync with the interventional guidewire. The distal true lumen can be determined by contralateral angiography. For cases in which a balloon cannot cross the lesion, the initial step is to advance a small (1.2–1.5 mm in diameter) balloon as deep as possible into the lesion to modify the proximal cap. When using small balloons, it is important to use longer length balloons (15–20 mm) because the largest profile of these balloons is at the mid shaft marker and the balloon tip will often penetrate the occlusion and stop at the marker. At this point, the balloon can be inflated to high pressure (14–16 atm) to determine if the lesion can be crossed from proximal to distal. If this fails, the next maneuver is to intentionally rupture the small balloon so as to modify the morphology of the proximal vessel/cap. If this fails to enable crossing then either a Corsair catheter, Asahi Intecc, (Nagoya, Japan) for more tortuous or less calcified lesions, or the Tornus catheter (Asahi Intecc) for more calcified lesions with shorter proximal stumps can be used.42 This is followed by maneuvers that can increase guide catheter support, such as use of guide catheter extensions43 or anchor techniques.4 Occasionally, a FineCross (Terumo, Somerset, New Jersey) or Valet (Volcano, Rancho Cordova, California) catheter may be able to cross lesions that the Corsair and Tornus catheters could not. The catheters can be rotated to facilitate their passage, as this will reduce friction within the vessel. If these maneuvers fail then more aggressive techniques, such as the use of coronary laser,44 rotational atherectomy,45 and the Crosser catheter, FlowCardia Inc. (Bard, Peripheral Vascular, Tempte, AZ)46 can be employed. Rotational atherectomy and the Crosser catheter can be used even when the wire is not in the distal lumen but still in the vessel architecture. Small burrs (usually 1.25 mm and no larger than 1.5 mm) can be used to modify the proximal vessel architecture, which may allow the base of operations (i.e. the over-the-wire catheter) to be moved to a more advantageous location. However, rotational atherectomy requires exchanging the guidewire, which can be accomplished by exchanging through an over-the-wire balloon or microcatheter. In situations where the distal true lumen has not been reached, the last 2 cm of the radiopaque wire tip can be removed prior to placement in the artery, thereby providing further reach with the burr (part of the radiopaque portion of the wire should be preserved to prevent the burr from going off the guidewire). Alternatively, the wire can be looped further down the vessel prior to atherectomy. Rotational atherectomy in the subintimal space should only be attempted by very advanced CTO operators. If all of these techniques fail to achieve balloon crossing and/or balloon dilation of the lesion then success can often be achieved by recrossing the lesion within the subintimal space either in the antegrade direction using a prolapsed guide wire or CrossBoss catheter with re-entry of the true lumen prior to major branches,48 or using a retrograde approach with retrograde dissection and re-entry to go around the non-crossable or non-dilatable lesion. A meta-analysis of 65 studies with 18,061 patients undergoing CTO PCI reported a low incidence of acute complications. These were death 0.2 % (95 % CI: 0.1 % to 0.3 %); emergent coronary artery bypass grafting 0.1 % (95 % CI: 0.0 % to 0.2 %); stroke <0.01 % (95 % CI: 0.0 % to 0.1 %); MI 2.5 % (95 % CI: 1.9 % to 3.0 %); Q-wave MI 0.2 % (95 % CI: 0.1 % to 0.3 %); coronary perforation 2.9 % (95 % CI: 2.2 % to 3.6 %); tamponade 0.3 % (95 % CI: 0.2 % to 0.5 %); and contrast nephropathy 3.8 % (95 % CI: 2.4 % to 5.3 %).50 Given the low frequency of emergency coronary artery bypass grafting, the authors believe that surgical backup is not essential for CTO PCI programs, provided there is a tested plan for urgent transfer to a facility with cardiac surgery in case of complications. However, the performance of CTO PCI at facilities without on-site surgery is discouraged unless performed by an operator with considerable experience in CTO PCI and at a laboratory that has immediately available all interventional equipment needed for CTO PCI and for the management of potential complications. Although coronary perforations are common in CTO PCI (27.6 % in one series15), most perforations are related to localised wire exit sites from the vessel architecture and limited to angiographic evidence of contrast staining. In the above meta-analysis of CTO complications the risk of perforation was 2.9 % but the risk of tamponade only 0.3 %.50 There are three main perforation types. The first is main vessel perforation, which may require implantation of a covered stent. The second is distal wire perforation and the third is collateral vessel perforation, which may require coil embolisation.16 The availability of equipment for perforation management (covered stents and coils) and familiarity with their use is important for every CTO PCI program. Over the long-term, CTO interventions can be complicated by in-stent restenosis, stent thrombosis and coronary aneurysm formation. The use of drug-eluting stents significantly reduces the risk of restenosis (as described in part 1) without increasing the risk of stent thrombosis.54 The risk of coronary aneurysm formation and their management has been poorly studied. Among 560 patients undergoing CTO PCI in Japan, aneurysms were observed in 7.3 % of those where retrograde intervention was performed vs 2.6 % of those where antegrade intervention was performed.55 There is limited information on the long-term outcomes of the novel dissection/ re-entry and retrograde techniques.20 Target lesion revascularisation was required at five months for 52 % of 31 patients treated with the STAR technique,18 whereas target vessel revascularisation was required in 47.9 % of 74 patients treated with the contrast-guided STAR technique.56 In a single-centre study of 170 patients undergoing CTO PCI patients in whom the CrossBoss and Stingray devices were used (n=60) had similar long-term outcomes with 110 patients treated with other crossing strategies, in spite of its use in higher complexity cases.57 There are no published, long-term, outcome data on the use of the mini-STAR and LAST techniques (20). Similarly, only one of the 20 studies that examined the outcomes of patients treated with the retrograde approach provided long-term outcomes.20 The incidence of major adverse cardiac events in 24 patients during a median follow-up of 10.3 months was 18 %.58 Obtaining additional long-term data will be critical for assessing the comparative effectiveness of the various CTO crossing strategies. Dual injection is recommended for nearly all CTO PCI to determine the optimal crossing strategy and guide wire advancement into the distal true lumen. Strategies that provide enhanced guide catheter support (such as long sheaths, large-bore guiding catheters, use of guide catheter extensions, and anchor techniques) are important for maximising the success rate and efficiency of CTO PCI. Use of an over-the-wire system is strongly recommended in CTO PCI for enhancing the penetrating power of the guidewire, enabling change in tip shape and allowing guidewire change (stiff CTO guidewires are not optimal for crossing non-occluded coronary segments). Adherence to a procedural strategy (Figure 1) that standardises CTO technique and facilitates procedural success is recommended. Such a strategy would permit stepwise decision making for antegrade and retrograde methods, inform guidewire selection and incorporate alternative approaches for instances of initial failure. Given the paucity of long-term outcomes with use of novel crossing techniques (antegrade dissection/re-entry and retrograde), antegrade wire escalation is the preferred frontline CTO crossing technique, if technically feasible. 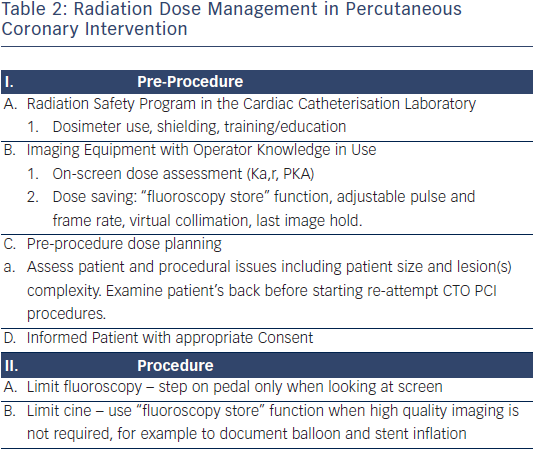 Using measures to minimise radiation exposure (including but not limited to use of 7.5 frames per second fluoroscopy and use of low magnification) and contrast administration is recommended. CTO PCI is best performed at centres with dedicated CTO PCI experience and expertise. Use of crossing difficulty prediction tools, such as the J-CTO score,9 can facilitate the selection of cases with a high likelihood of quick crossing that can be attempted at less experienced centres. Rinfret S, Joyal D, Nguyen CM, et al. Retrograde recanalization of chronic total occlusions from the transradial approach; early Canadian experience. Catheter Cardiovasc Interv 2011;78:366–74. Hamon M, Mehta S, Steg PG, et al. Impact of transradial and transfemoral coronary interventions on bleeding and net adverse clinical events in acute coronary syndromes. EuroIntervention 2011;7:91–7. Cantor WJ, Mahaffey KW, Huang Z, et al. Bleeding complications in patients with acute coronary syndrome undergoing early invasive management can be reduced with radial access, smaller sheath sizes, and timely sheath removal. Catheter Cardiovasc Interv 2007;69:73–83. Di Mario C, Ramasami N. Techniques to enhance guide catheter support. Catheter Cardiovasc Interv 2008;72:505–12. Galassi AR, Tomasello SD, Reifart N, et al. In-hospital outcomes of percutaneous coronary intervention in patients with chronic total occlusion: insights from the ERCTO (European Registry of Chronic Total Occlusion) registry. EuroIntervention 2011;7:472–9. Michael TT, Mogabgab O, Fuh E, et al. Application of the “hybrid approach” to chronic total occlusion interventions: a detailed procedural analysis. J Interv Cardiol 2014;27:36–43. Brilakis ES, Grantham JA, Rinfret S, et al. 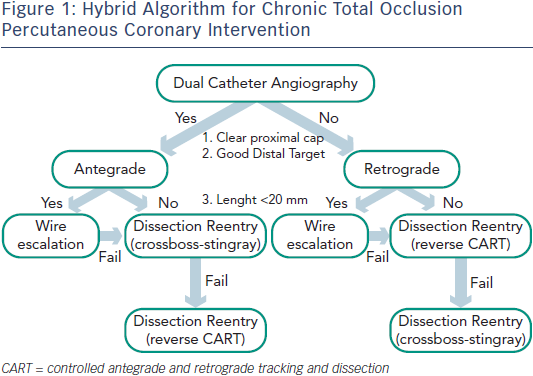 A percutaneous treatment algorithm for crossing coronary chronic total occlusions. JACC Cardiovasc Interv 2012;5:367–79. Brilakis ES, Grantham JA, Thompson CA, et al. The retrograde approach to coronary artery chronic total occlusions: a practical approach. Catheter Cardiovasc Interv 2012;79:3–19. Morino Y, Abe M, Morimoto T, et al. Predicting successful guidewire crossing through chronic total occlusion of native coronary lesions within 30 minutes: the J-CTO (Multicenter CTO Registry in Japan) score as a difficulty grading and time assessment tool. JACC Cardiovasc Interv 2011;4:213–21. Nombela-Franco L, Urena M, Jerez-Valero M, et al. Validation of the J-chronic total occlusion score for chronic total occlusion percutaneous coronary intervention in an independent contemporary cohort. Circ Cardiovasc Interv 2013;6:635–43. Rathore S, Katoh O, Matsuo H, et al. 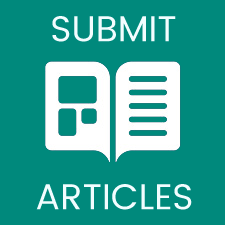 Retrograde percutaneous recanalization of chronic total occlusion of the coronary arteries: procedural outcomes and predictors of success in contemporary practice. Circ Cardiovasc Interv 2009;2:124–32. Grantham JA, Marso SP, Spertus J, et al. Chronic total occlusion angioplasty in the United States. JACC Cardiovasc Interv 2009;2:479–86. Morino Y, Kimura T, Hayashi Y, et al. In-hospital outcomes of contemporary percutaneous coronary intervention in patients with chronic total occlusion insights from the J-CTO Registry (Multicenter CTO Registry in Japan). JACC Cardiovasc Interv 2010;3:143–51. Sianos G, Werner GS, Galassi AR, et al. Recanalisation of chronic total coronary occlusions: 2012 consensus document from the EuroCTO club. EuroIntervention 2012;8:139–45. Rathore S, Matsuo H, Terashima M, et al. Procedural and in-hospital outcomes after percutaneous coronary intervention for chronic total occlusions of coronary arteries 2002 to 2008: impact of novel guidewire techniques. JACC Cardiovasc Interv 2009;2:489–97. Brilakis ES, Karmpaliotis D, Patel V, Banerjee S. Complications of chronic total occlusion angioplasty. Interventional Cardiology Clinics 2012;1:373–89. Mitsudo K, Yamashita T, Asakura Y, et al. Recanalization strategy for chronic total occlusions with tapered and stiff-tip guidewire. The results of CTO new techniQUE for STandard procedure (CONQUEST) trial. J Invasive Cardiol 2008;20:571–7. Colombo A, Mikhail GW, Michev I, et al. Treating chronic total occlusions using subintimal tracking and reentry: the STAR technique. Catheter Cardiovasc Interv 2005;64:407–11; discussion 412. Valenti R, Vergara R, Migliorini A, et al. Predictors of reocclusion after successful drug-eluting stent-supported percutaneous coronary intervention of chronic total occlusion. J Am Coll Cardiol 2013;61:545–50. Michael TT, Papayannis AC, Banerjee S, Brilakis ES. Subintimal dissection/reentry strategies in coronary chronic total occlusion interventions. Circ Cardiovasc Interv 2012;5:729–38. Carlino M, Godino C, Latib A, et al. Subintimal tracking and re-entry technique with contrast guidance: a safer approach. Catheter Cardiovasc Interv 2008;72:790–6. Carlino M, Latib A, Godino C, et al. CTO recanalization by intraocclusion injection of contrast: the microchannel technique. Catheter Cardiovasc Interv 2008;71:20–6. Galassi AR, Tomasello SD, Costanzo L, et al. Mini-STAR as bail-out strategy for percutaneous coronary intervention of chronic total occlusion. Catheter Cardiovasc Interv 2012;79:30-40. Whitlow PL, Burke MN, Lombardi WL, et al. Use of a novel crossing and re-entry system in coronary chronic total occlusions that have failed standard crossing techniques: results of the FAST-CTOs (Facilitated Antegrade Steering Technique in Chronic Total Occlusions) trial. JACC Cardiovasc Interv 2012;5:393–401. Werner GS, Schofer J, Sievert H, et al. Multicentre experience with the BridgePoint devices to facilitate recanalisation of chronic total coronary occlusions through controlled subintimal re-entry. EuroIntervention 2011;7:192–200. Surmely JF, Tsuchikane E, Katoh O, et al. New concept for CTO recanalization using controlled antegrade and retrograde subintimal tracking: the CART technique. J Invasive Cardiol 2006;18:334–8. Thompson CA, Jayne JE, Robb JF, et al. Retrograde techniques and the impact of operator volume on percutaneous intervention for coronary chronic total occlusions an early U.S. experience. JACC Cardiovasc Interv 2009;2:834–42. Karmpaliotis D, Michael TT, Brilakis ES, et al. Retrograde coronary chronic total occlusion revascularization: procedural and in-hospital outcomes from a multicenter registry in the United States. JACC Cardiovasc Interv 2012;5:1273–9. Michael TT, Karmpaliotis D, Brilakis ES, et al. Procedural Outcomes of Revascularization of Chronic Total Occlusion of Native Coronary Arteries (from a Multicenter United States Registry). Am J Cardiol 2013;112:488–92. El Sabbagh A, Patel VG, Jeroudi OM, et al. Angiographic success and procedural complications in patients undergoing retrograde percutaneous coronary chronic total occlusion interventions: A weighted meta-analysis of 3482 patients from 26 studies. Int J Cardiol 2014:174:243-8. Tsuchikane E, Katoh O, Kimura M, et al. The first clinical experience with a novel catheter for collateral channel tracking in retrograde approach for chronic coronary total occlusions. JACC Cardiovasc Interv 2010;3:165–71. Galassi AR, Tomasello SD, Costanzo L, Tamburino C. Retrograde approach for chronic total occlusion percutaneous revascularization. Interventional Cardiology 2010;2:391–403. Hsu JT, Tamai H, Kyo E, et al. Traditional antegrade approach versus combined antegrade and retrograde approach in the percutaneous treatment of coronary chronic total occlusions. Catheter Cardiovasc Interv 2009;74:555–63. Galassi AR. 2010. Coronary Interventions for Chronic Total Occlusions; Galassi’s Tips and Tricks: Alpha. Kimura M, Katoh O, Tsuchikane E, et al. The efficacy of a bilateral approach for treating lesions with chronic total occlusions the CART (controlled antegrade and retrograde subintimal tracking) registry. JACC Cardiovasc Interv 2009;2:1135–41. Sianos G, Barlis P, Di Mario C, et al. European experience with the retrograde approach for the recanalisation of coronary artery chronic total occlusions. A report on behalf of the euroCTO club. EuroIntervention 2008;4:84–92. Thompson CA. Percutaneous revascularization of coronary chronic total occlusions: the new era begins. JACC Cardiovasc Interv 2010;3:152–4. Karmpaliotis D, Lembo NJ, Brilakis ES, Kandzari DE. Percutaneous Chronic Total Occlusion Revascularization Program Development, Resource Utilization, and Economic Outcomes. Intervent Cardiol Clin 2012;1:391–5. Levine GN, Bates ER, Blankenship JC, et al. 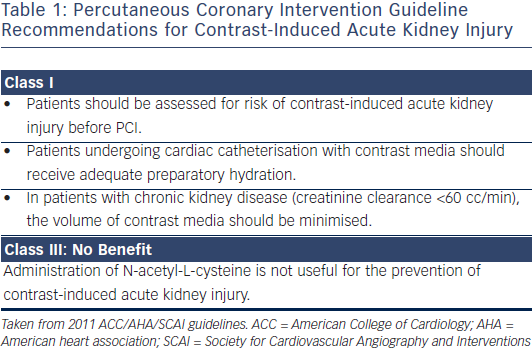 2011 ACCF/AHA/ SCAI Guideline for Percutaneous Coronary Intervention: executive summary: a report of the American College of Cardiology Foundation/American Heart Association Task Force on Practice Guidelines and the Society for Cardiovascular Angiography and Interventions. Catheter Cardiovasc Interv 2012;79:453–95. Fang HY, Lee CH, Fang CY, et al. Application of penetration device (Tornus) for percutaneous coronary intervention in balloon uncrossable chronic total occlusion-procedure outcomes, complications, and predictors of device success. Catheter Cardiovasc Interv 2011;78:356–62. Luna M, Papayannis A, Holper EM, et al. Transfemoral use of the GuideLiner catheter in complex coronary and bypass graft interventions. Catheter Cardiovasc Interv 2012;80:437–46. Shen ZJ, Garcia-Garcia HM, Schultz C, et al. Crossing of a calcified “balloon uncrossable” coronary chronic total occlusion facilitated by a laser catheter: a case report and review recent four years’ experience at the Thoraxcenter. Int J Cardiol 2010;145:251–4. Pagnotta P, Briguori C, Mango R, et al. Rotational atherectomy in resistant chronic total occlusions. Catheter Cardiovasc Interv 2010;76:366–71. Galassi AR, Tomasello SD, Costanzo L, et al. Recanalization of complex coronary chronic total occlusions using high-frequency vibrational energy CROSSER catheter as first-line therapy: a single center experience. J Interv Cardiol 2010;23:130–8. Lindsey JB, Banerjee S, Brilakis ES. Two “buddies” may be better than one: use of two buddy wires to expand an underexpanded left main coronary stent. J Invasive Cardiol 2007;19:E355–8. Michael TT, Banerjee S, Brilakis ES. Subintimal distal anchor technique for “balloon-uncrossable” chronic total occlusions. J Invasive Cardiol 2013;25:552–4. Magro M, Schultz C, Simsek C, et al. Computed tomography as a tool for percutaneous coronary intervention of chronic total occlusions. EuroIntervention 2010;6 Suppl G:G123–31. Patel VG, Brayton KM, Tamayo A, et al. Angiographic success and procedural complications in patients undergoing percutaneous coronary chronic total occlusion interventions: a weighted meta-analysis of 18,061 patients from 65 studies. JACC Cardiovasc Interv 2013;6:128–36. Mehran R, Aymong ED, Nikolsky E, et al. A simple risk score for prediction of contrast-induced nephropathy after percutaneous coronary intervention: development and initial validation. J Am Coll Cardiol 2004;44:1393–9. Dangas G, Iakovou I, Nikolsky E, et al. Contrast-induced nephropathy after percutaneous coronary interventions in relation to chronic kidney disease and hemodynamic variables. Am J Cardiol 2005;95:13–9. Laskey WK, Jenkins C, Selzer F, et al. Volume-to-creatinine clearance ratio: a pharmacokinetically based risk factor for prediction of early creatinine increase after percutaneous coronary intervention. J Am Coll Cardiol 2007;50:584–90. Saeed B, Kandzari DE, Agostoni P, et al. Use of drug-eluting stents for chronic total occlusions: a systematic review and meta-analysis. Catheter Cardiovasc Interv 2011;77:315–32. Tanaka H, Kadota K, Hosogi S, et al. Mid-term angiographic and clinical outcomes from antegrade versus retrograde recanalization for chronic total occlusions. J Am Coll Cardiol 2011;57:E1628. Godino C, Latib A, Economou FI, et al. Coronary chronic total occlusions: mid-term comparison of clinical outcome following the use of the guided-STAR technique and conventional anterograde approaches. Catheter Cardiovasc Interv 2012;79:20–7. Mogabgab O, Patel VG, Michael TT, et al. Long-Term Outcomes With Use of the CrossBoss and Stingray Coronary CTO Crossing and Re-Entry Devices. J Invasive Cardiol 2013;25:579–85. Lee NH, Seo HS, Choi JH, et al. Recanalization strategy of retrograde angioplasty in patients with coronary chronic total occlusion -analysis of 24 cases, focusing on technical aspects and complications. Int J Cardiol 2010;144:219–29. Chambers CE, Fetterly KA, Holzer R, et al. Radiation safety program for the cardiac catheterization laboratory. Catheter Cardiovasc Interv 2011;77:546–56.